Sugar, Coconut Milk (Contains Milk Protein), Salt, Contains Permitted Stabiliser, Flavouring (Contains Soy). 2. 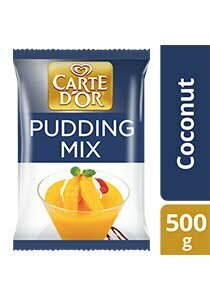 Stir in 1 pouch (500g) of Carte d'Or Coconut Flavoured Pudding Mix slowly until dissolved.